Q: What do you hope to accomplish with your blog? Is it to one day become an author yourself, just for fun, maybe get some online attention, or maybe something very different? When we started our blog we just wanted to share what we thought about the books that we had read, and most importantly we wanted to share our favorite books with others. Now I just do it because I enjoy it. I would love to write books someday but that isn't what drives me to blog, I simply love books and love to read. Congratulations for being featured! ;) New follower! It's great to meet people who love the same books I do. So I know what you mean. I love making the sharing books with other book lovers too. Congrats on being featured! Congratulations!! Sharing books and thoughts on books is the best! Thank you :) I do love it, blogging is the best. Reading and sharing books I had read was my main motivation as well. That was my main motivation as well. I love sharing good books. Congrats on the feature! I'm a new follower. Congrats on being featured this week! We started blogging so that we could share our love of reading, too. I agree the love of reading and sharing is great! New follow via FF. Congrats on the feature. Hopping through. At the heart, enjoyment is the main reason I blog. It's an incredible hobby. Congratulations on the feature this week! I am a new follower hopping through. Congrats on being featured! New follower here! New follower hoping through I feel the same way I glad to have some where to express myself with like minds who ove books just as much as I do. Love your answer. I think if I ended up only doing the blog to network and not because of my love of books that I wouldn't have the urge to blog anymore. Old follower. Congrats on the Feature! Just found your blog through Parajunkee's feature, congrats! I blog for much the same reasons. Its all about the book love! BTW, my blog is http://readitreviewedit.blogspot.com.au/ If you'd like to come say hi! Congrats on being featured! It's exciting, isn't it? I am already following you by linky and GFC. Good answer. Here's my FF post for this week. Congrats on being featured, and have a fabulous weekend! I just wanted to get my thoughts out there so they weren't just knocking around in my head!! Haha!! Me too. I just love reading so much it's fun to talk to others about it. I don't think it's possible to tolerate the workload of a book blogger without the love of books. Congrats on the feature! I'm a new follower on GFC. Congrats on the feature! That is why I want to blog as well! Congratulations on getting featured :). That's great! Awesome answer as well. Congrats on the feature and thank you for sharing your love of books! Congrats on the feature.. your blog is very cute. I agree with most everyone else.. I just love reading and talking about books! Weeeww, okay, I just did this really lame thing and scrolled all the way to the bottom thinking the comment box was down there but anywayss, congrats on getting featured! I loved your answer, short and sweet - I'm guessing every book blogger blogs for their love of everything book-ish. new follower and here's my FF for the week! If you love a great YA Paranormal book here is your chance to get a fabulous one for free on amazon today. Get your free copy of Forbidden Mind on Amazon Today. You really don't want to miss this book! Blogs like this are perfect for me. I rarely pick up a book without having checked out the reviews I can find by googling it. :D I'm a new follower on GFC. 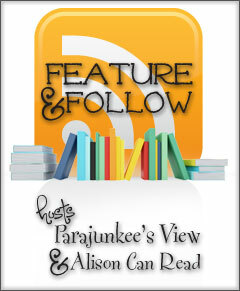 New follower here, trying to get my blog up and running-- I love this feature! So many people to follow! adorable blog! I love the pink & gray theme - it goes together so well! Congrats on your feature :-) Great answer! That sounds a lot like my reasons as well! Congratulations on being featured this week. same reasons I love to blog though I don't think I would ever write. Thanks Kate :) I'm following you back now. Lol, there were an awful lot of comments :) I'm still working on getting everyone followed back, and I'm following you now. Thanks for stopping by! I love to write, and I think I'm going to do the whole NaNoWriMo thing next month :) Thanks for stopping by, I'm an old follower. Thanks Kelly :) I followed you back via GFC. Thank you for stopping by Nina! I really do enjoy it :) I'm an old follower via GFC. Thank you Ashley :) I'm an old follower, thanks so much for stopping by! Love your blog, very unique and cool :) Thanks for stopping by!